Eric Balkanski, F. Blanchet-Sadri, Matthew Kilgore and Benjamin Wyatt, “Partial Word DFAs.” In S. Konstantinidis (Ed. ), CIAA 2013, 18th International Conference on Implementation and Application of Automata, July 16-19, 2013, Halifax, Nova Scotia, Canada, Lecture Notes in Computer Science, Vol. 7982, Springer-Verlag, Berlin, Heidelberg, 2013, pp 36-47. Received “Best Paper Award” of CIAA 2013. Eric Balkanski, F. Blanchet-Sadri, Matthew Kilgore and Benjamin Wyatt, “On the State Complexity of Partial Word DFAs.” Theoretical Computer Science, to appear. F. Blanchet-Sadri, Michelle Bodnar, Nathan Fox and Joe Hidakatsu, “A Graph Polynomial Approach to Primitivity.” In A.-H. Dediu, C. Martin-Vide and B. Truthe (Eds. ), LATA 2013, 7th International Conference on Language and Automata Theory and Applications, April 2-5, 2013, Bilbao, Spain, Lecture Notes in Computer Science, Vol. 7810, Springer-Verlag, Berlin, Heidelberg, 2013, pp 153-164. F. Blanchet-Sadri and Nathan Fox, “On the Asymptotic Abelian Complexity of Morphic Words.” In M.-P. Beal and O. Carton (Eds. ), DLT 2013, 17th International Conference on Developments in Language Theory, June 18-21, 2013, Paris-Est, France, Lecture Notes in Computer Science, Vol. 7907, Springer-Verlag, Berlin, Heidelberg, 2013, pp 94-105. F. Blanchet-Sadri, Nathan Fox and Narad Rampersad, “On the Asymptotic Abelian Complexity of Morphic Words.” Advances in Applied Mathematics, Vol. 61, 2014, pp 46-84. F. Blanchet-Sadri, James Currie, Nathan Fox and Narad Rampersad, “Abelian Complexity of Fixed Point of Morphism 0-012, 1-02, 2-1.” INTEGERS, Vol. 14, 2014, #A11. F. Blanchet-Sadri, Ian Coley and Benjamin De Winkle, “Abelian Powers in Partial Words.”. F. Blanchet-Sadri, Benjamin De Winkle and Sean Simmons, “Abelian Pattern Avoidance in Partial Words.” RAIRO-Theoretical Informatics and Applications, Vol. 48, No. 3, 2014, pp 315-339. F. Blanchet-Sadri, Jordan Nikkel, J. D. Quigley and Xufan Zhang, “Computing Primitively-Rooted Squares and Runs in Partial Words.” In J. Kratochvil and M. Miller (Eds. ), IWOCA 2014, 25th International Workshop on Combinatorial Algorithms, October 15-17, 2014, Duluth, Minnesota, Lecture Notes in Computer Science, Springer-Verlag, Berlin, Heidelberg, to appear. F. Blanchet-Sadri and Justin Lazarow, “Suffix Trees for Partial Words and the Longest Common Compatible Prefix Problem.” In A.-H. Dediu, C. Martin-Vide and B. Truthe (Eds. ), LATA 2013, 7th International Conference on Language and Automata Theory and Applications, April 2-5, 2013, Bilbao, Spain, Lecture Notes in Computer Science, Vol. 7810, Springer-Verlag, Berlin, Heidelberg, 2013, pp 165-176. F. Blanchet-Sadri, Andrew Lohr, Sean Simmons and Brent Woodhouse, “Computing Depths of Patterns.” In A.-H. Dediu et al. (Eds. ), LATA 2014, 8th International Conference on Language and Automata Theory and Applications, March 10-14, 2014, Madrid, Spain, Lecture Notes in Computer Science, Vol. 8370, Springer International Publishing Switzerland, 2014, pp 173-185. F. Blanchet-Sadri and Brent Woodhouse, “Strict Bounds for Pattern Avoidance.” In M.-P. Beal and O. Carton (Eds. ), DLT 2013, 17th International Conference on Developments in Language Theory, June 18-21, 2013, Paris-Est, France, Lecture Notes in Computer Science, Vol. 7907, Springer-Verlag, Berlin, Heidelberg, 2013, pp 94-105. F. Blanchet-Sadri and Brent Woodhouse, “Strict Bounds for Pattern Avoidance.” Theoretical Computer Science, Vol. 506, 2013, pp 17-28. F. Blanchet-Sadri and Sinziana Munteanu, “Deciding Representability of Words of Equal Length in Polynomial Time.” In T. Lecroq and L. Mouchard (Eds. ), IWOCA 2013, 24th International Workshop on Combinatorial Algorithms, July 10-12, 2013, Rouen, France, Lecture Notes in Computer Science, Vol. 8288, Springer-Verlag, Berlin, Heidelberg, 2013, pp 28-40. 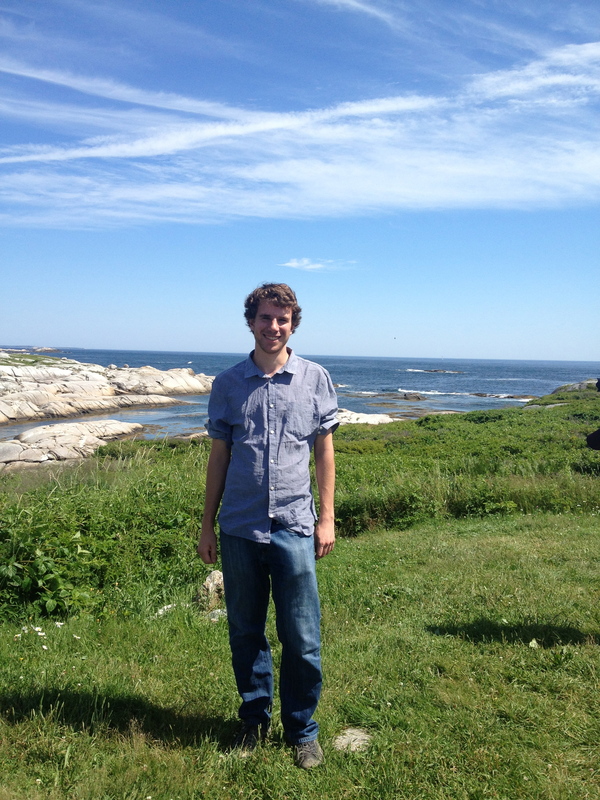 Matthew Kilgore has been named a 2013 Goldwater Scholar. Justin Lazarow, “Suffix Trees for Partial Words and the Longest Common Compatible Prefix Problem,” LATA 2013, 7th International Conference on Language and Automata Theory and Applications, Bilbao, Spain, April 5, 2013 (joint work with F. Blanchet-Sadri). Justin Lazarow presenting the paper entitled “Suffix trees for partial words and the longest common compatible prefix problem,” at LATA 2013, 7th International Conference on Language and Automata Theory and Applications, Bilbao, Spain, April 5, 2013. Michelle Bodnar, “A Graph Theoretical Approach to Primitivity,” LATA 2013, 7th International Conference on Language and Automata Theory and Applications, Bilbao, Spain, April 5, 2013 (joint work with F. Blanchet-Sadri, Nathan Fox and Joe Hidakatsu). Michelle Bodnar presenting the paper entitled “A graph polynomial approach to primitivity,” at LATA 2013, 7th International Conference on Language and Automata Theory and Applications, Bilbao, Spain, April 5, 2013. From left to right, Justin Lazarow, Michelle Bodnar and Joe Hidakatsu attending LATA 2013, 7th International Conference on Language and Automata Theory and Applications, Bilbao, Spain, from April 2 to April 5, 2013. F. Blanchet-Sadri, “Partial Word Representation,” Fields Workshop on Challenges in Combinatorics on Words, Fields Institute, Toronto, Ontario, Canada, April 22, 2013. F. Blanchet-Sadri, “Strict Bounds for Pattern Avoidance,” Fields Workshop on Challenges in Combinatorics on Words, Fields Institute, Toronto, Ontario, Canada, April 25, 2013 (joint work with Brent Woodhouse). Brent Woodhouse, “Strict Bounds for Pattern Avoidance,” DLT 2013, 17th International Conference on Developments in Language Theory, Paris-Est, France, June 18, 2013 (joint work with F. Blanchet-Sadri). Brent Woodhouse presenting the paper entitled “Strict Bounds for Pattern Avoidance,” at DLT 2013, 17th International Conference on Developments in Language Theory, Paris-Est, France, June 18, 2013. Nathan Fox, “On the Asymptotic Abelian Complexity of Morphic Words,” DLT 2013, 17th International Conference on Developments in Language Theory, Paris-Est, France, June 21, 2013 (joint work with F. Blanchet-Sadri). Nathan Fox presenting the paper entitled “On the Asymptotic Abelian Complexity of Morphic Words,” at DLT 2013, 17th International Conference on Developments in Language Theory, Paris-Est, France, June 21, 2013. From left to right, Nathan Fox and Brent Woodhouse attending DLT 2013, 17th International Conference on Developments in Language Theory, Paris-Est, France, June 20, 2013. F. Blanchet-Sadri, “Partial Word DFAs,” CIAA 2013, 18th International Conference on Implementation and Application of Automata, Halifax, Nova Scotia, Canada, July 16, 2013 (joint work with Eric Balkanski, Matthew Kilgore and B. J. Wyatt). From left to right, Dr. Stavros Konstantinidis and Eric Balkanski at CIAA 2013, 18th International Conference on Implementation and Application of Automata, Halifax, Nova Scotia, Canada (the paper entitled “Partial Word DFAs” co-authored with Eric Balkanski, Francine Blanchet-Sadri, Matthew Kilgore, and Benjamin Wyatt was awarded “BEST PAPER AWARD of CIAA 2013” on July 19, 2013). Eric Balkanski attending CIAA 2013, 18th International Conference on Implementation and Application of Automata, Halifax, Nova Scotia, Canada, July 18, 2013. Sinziana Munteanu, “Deciding Representability of Sets of Words of Equal Length in Polynomial Time,” IWOCA 2013, 24th International Workshop on Combinatorial Algorithms, Rouen, France, July 10, 2013 (joint work with F. Blanchet-Sadri). Sinziana Munteanu presenting the paper entitled “Deciding Representability of Words of Equal Length in Polynomial Time,” at IWOCA 2013, 24th International Workshop on Combinatorial Algorithms, Rouen, France, July 10, 2013. Sinziana Munteanu attending IWOCA 2013, 24th International Workshop on Combinatorial Algorithms, Rouen, France, July 10-12, 2013. Andrew Lohr, “Computing Depths of Patterns,” LATA 2014, 8th International Conference on Language and Automata Theory and Applications, Madrid, Spain, March 13, 2014 (joint work with F. Blanchet-Sadri, Sean Simmons and Brent Woodhouse). Andrew Lohr presenting the paper entitled “Computing depths of patterns,” at LATA 2014, 8th International Conference on Language and Automata Theory and Applications, Madrid, Spain, March 13, 2014. Andrew Lohr attending LATA 2014, 8th International Conference on Language and Automata Theory and Applications, Madrid, Spain, from March 10 to March 14, 2014. F. Blanchet-Sadri chaired a session for the 7th International Conference on Language and Automata Theory and Applications, Bilbao, Spain, April 2, 2013. 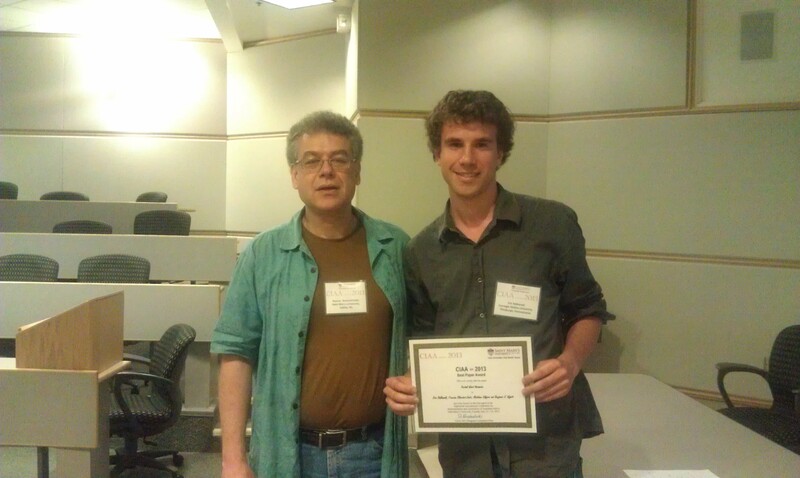 F. Blanchet-Sadri was invited to be a participant in the "Fields Workshop on Challenges in Combinatorics on Words" that was held at the Fields Institute, Toronto, Canada from April 22 to April 26, 2013.